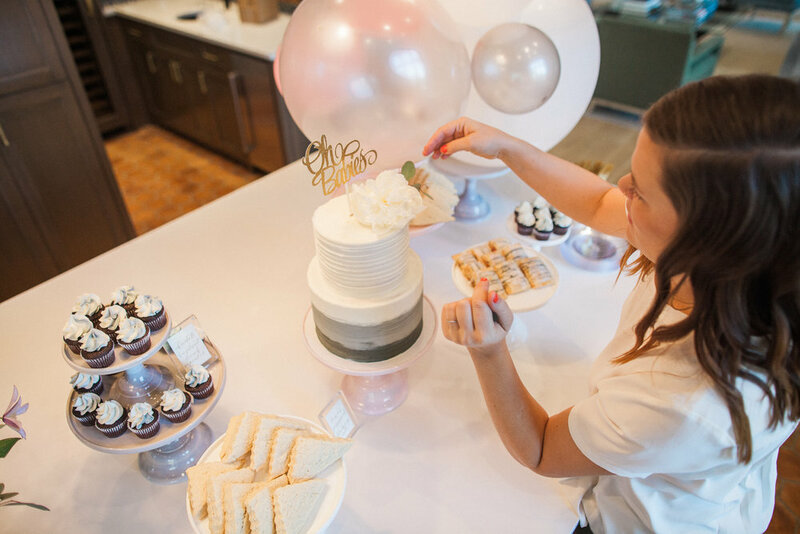 Today, I'm giving you the full behind-the-scenes on what it looks like to hire Melody's Joy to come into your home, set-up and style a signature dessert table for your bash. I'm taking you inside the beautiful home of my client who is hosting a baby shower for her friend. It's your home, your party and I'm here to make you shine. You have some legit celebrating to do SO of course that includes splurging on your favorite desserts! You want to throw an epic party so you've hired Melody's Joy to help make it pop. We'll connect and I'll learn what occasion you're celebrating, how many guests you're expecting and what type of desserts you want displayed. Understanding the aesthetic and the layout of the home informs the design. I want the tablescape to complement both your own personal style and as well as your home. From the moment your guests walk into the room, I want them to be allured by the dessert table. 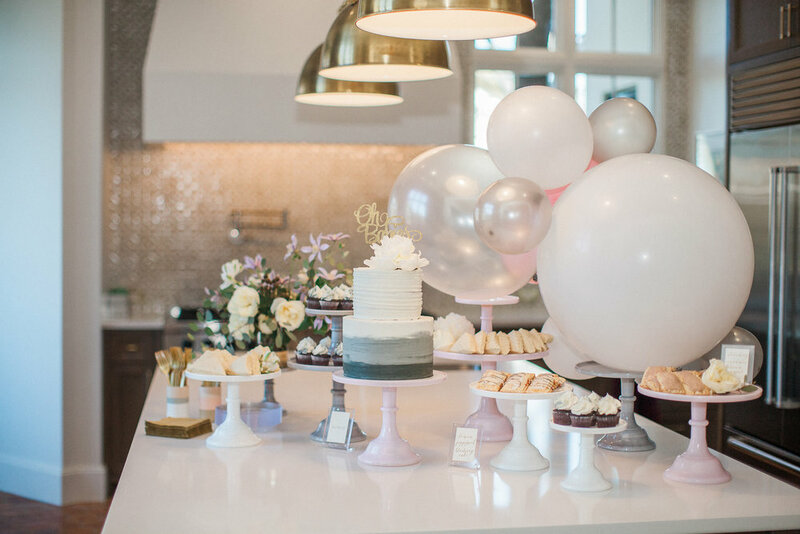 The kitchen island served as the perfect stage for the desserts. Knowing there would not be a backdrop or wall to utilize, I began creating a free standing balloon cluster as a fun installation. This celebration was a baby shower to honor an expectant mother of twins- a boy and girl. To not appear overly feminine, I choose classic-style pedestals and a color palette of grey, white and light pink. I often coordinate with bakers to pick-up the desserts on your behalf if permitted. Part of styling your table includes arranging your desserts in a tasteful way and knowing which desserts pair best with my displays. For this event I coordinated with the baker ahead of time and brought along the desserts. Danae from Feathers & Frosting is a confectionary genius. The shower took place on a late Saturday morning so she designed the menu with a breakfast spin, adding adorable pop tarts and scones. The other thing about Danae that I love- she always nails my requests for specific colors or dessert designs. 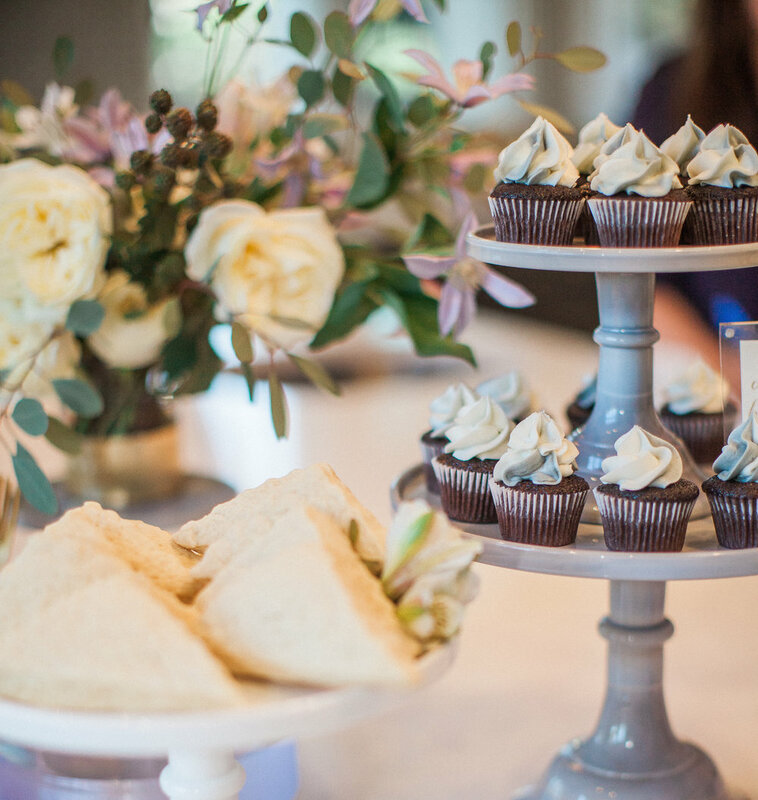 For example, the Lemon Poppyseed and Blueberry Cake were painted in a grey ombré and the Hazelnut Crunch Cupcakes in similar hues. Total hits. In event styling, we all know details are king. Florals are high-ranking on my list for table accents. I'll style small floral accents but for larger requests and statement pieces I'll source out to my favorite experts. I'll always coordinate with the florists ahead of time, looping them in on my mockup to ensure they are aligned with the overall vision for the table. I couldn't have been more pleased with how well the arrangements by Valerie of Davy Gray added to the tablescape. She choose pirouette clematis to draw out the grey tones, including peeks of blackberries. Of course, a white peony topped the cake (pretty gender neutral for a flower, don't you think?!). Desserts are so creative these days- I think it's important for the flavors to be featured and the guests to know their options. Hand-written calligraphy labels accented the desserts, beautifully written by Jen Krause Calligraphy & Design. The small acrylic frames added a clean and modern element. Did I mention this was a champagne and dessert party?! I want your dessert table to look stunning and be a memorable experience for your guests. The best way I know to do that is nail the design that you had envisioned and pay close attention to the elements that matter- creatively-styled and personalized just for you. Your guests arrive and its time to celebrate! For me, these are the moments that make life rich...celebrating things that matter the most with the people you love the most. I'm honored to be a part of it all! The connection and friendships I form with you are some of my favorite too. I can't end this BTS without a photo of one of the most hospitable people I've ever met and host of this event, my friend Nancy. 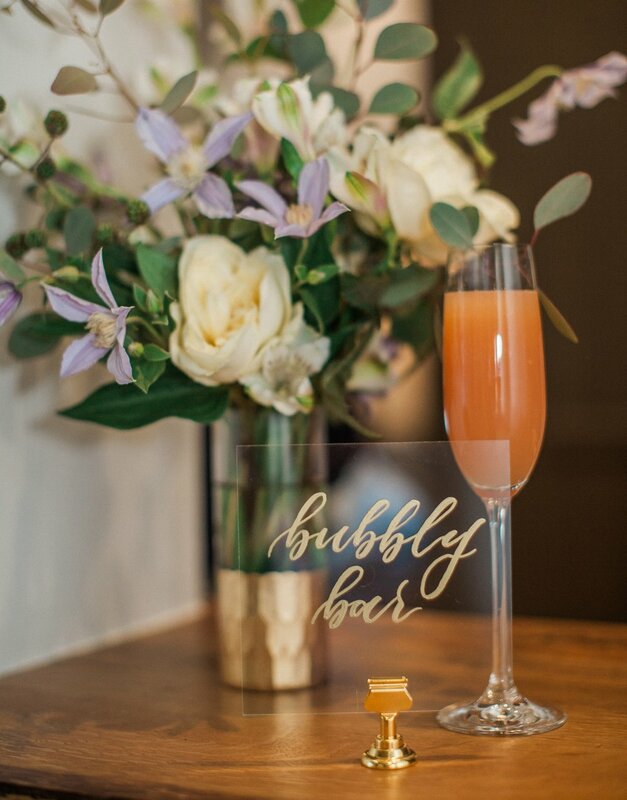 All the photo credit and so much thanks goes to Ashlee Newman Photography for capturing this event in such a lovely way to share with you! Have a special event coming up that you'd like Melody's Joy to be a part of? Let's connect! Thank-you! We'll review your request, follow-up with you shortly and send an official invoice. Way to BEAT THE HEAT! 1. Pick a date and invite those friends over who you've been wanting to connect with all summer. 2. 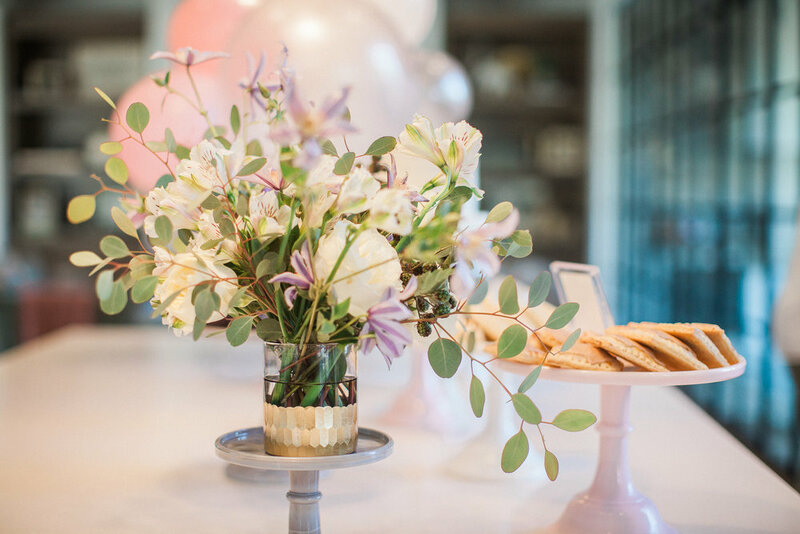 Choose from our END-OF-SUMMER COMBO SALE (details below), a party package that includes bright colored cake stands with matching party decor so you can easily create a fun styled dessert table or food table at your party. 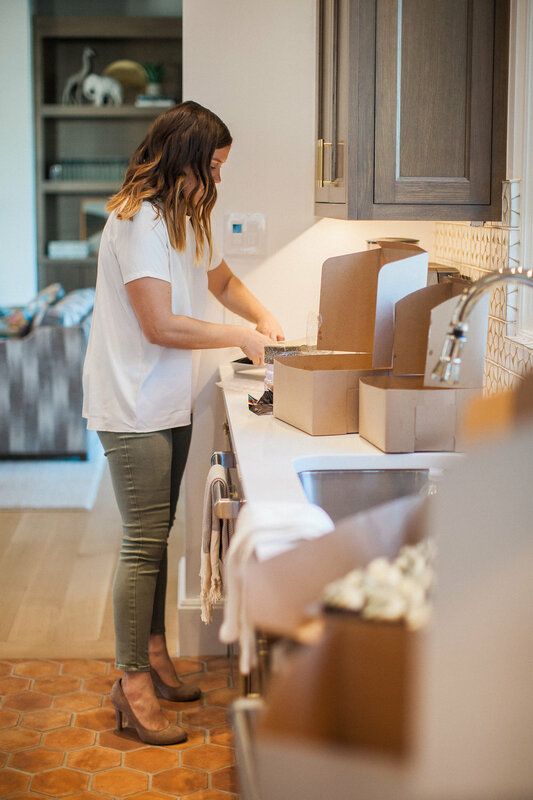 We'll package it all together for a one-stop pickup the day before your bash. 3. Head on over to your favorite bakery or grocery and grab some fresh fruit, snacks and your favorite desserts that scream summertime. My go-to's include watermelon, strawberries and pretty much any lemon flavored pastry. 4. Grab some refreshing bevies. There's always Rosé but my most recent find is a sparkling water brand called Spindrift (sold at Trader Joe's) which is made with real squeezed fruit, nothing else added. It's SO GOOD. (insider tip: grapefruit and lemon are the best flavors.) Also, never underestimate the greatness of sparkling water and citrus slices. 5. Set-up at your location: If a poolside party is an option for you, you're definitely winning. But this set-up can be done anywhere, indoors or out. Summer evenings are the best. With the displays and decor already picked out the rest of your set-up will be pretty effortless. You'll have time to get your favorite playlist rockin' and a drink in hand when your pals arrive. 6. Relax and throwback with your friends in a really special way. Soak it in. You're doing summer right.